The Boston Celtics haven't been the most impressive free-throw shooting team this season. In fact, you can find them right in the middle of the pack when compared to other NBA teams: 15th out of the 30 total squads, with a rate of 76.9 percent. This shouldn't be too surprising for Celtic's fans, as this has been an issue for the team since the very first game of the season, when they went 19-25 from the line versus the Cleveland Cavaliers in October, and took their first loss in their first game. Things however, are looking up! The Cs are having their best foul-shooting month of the season this January, and are nearly breaking the 80% mark in that period. Since the new year began, the Celtics have hit 79.6% of their shots from the line. That number shot up a few ticks because of their performance last night. In their game against the Los Angeles Clippers, the Celtics earned 22 free-throw attempts, and hit damn near all of them! 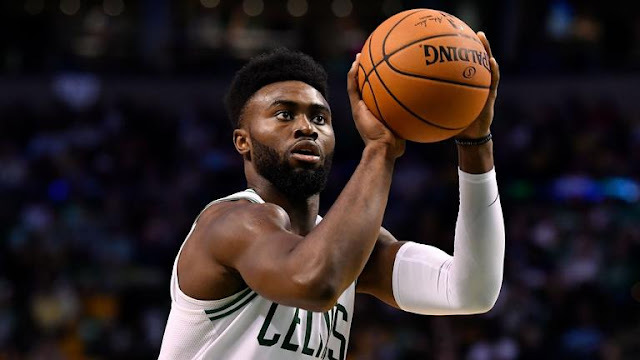 They only missed once, and it was from repeat-free-throw-offender, Jaylen Brown, who actually had one of his best night's after being fouled all season, hitting 5-of-6 of those shots. The final tally for the team was 21 makes on 22 attempts, which can be translated to a percentage of 95.5%. Easily one of their best games all season in the category. The only other game where they shot better was just after Christmas, when they hit 13-of-13 free throws against the Charlotte Hornets in a 102-91 victory. Good things happen when you hit your free throws! Terry Rozier lead the team in free-throw makes last night, and went 6-for-6 from the line. His aggression was apparent in the contest, which is something that Cs' fans have been waiting for from the third year guard. He finished with 15 points, 3 rebounds, and 4 assists. Entering tonight, Terry Rozier had not attempted a single free-throw during 2018. He broke that streak tonight by going 6-of-6 from the stripe. The Golden State Warriors lead the NBA in FT%, and are hitting 81.7% of their charity shots. The Los Angeles Lakers, are on the bottom of the list, and are only shooting at a 68.5% clip from the line this season. Free throws are on overlooked statistic in this league, but can truly make or break a game. If the Celtics want to make a run come playoff time, they'll have to keep this rising trend going. I believe that they'll be able to do it, as long as they relax in the moment, take some deep inhales, and before they let it fly, can put themselves in the right mindset to "be the ball."